What role does management play in the agile world of self-organizing teams? What is the function of managers in this new world? What does an agile organization need from its management team? Where should the agile manager focus their efforts for greatest benefit? Perhaps unsurprisingly, the competencies are not revolutionary. In fact, they are largely similar to what most organizations expect of their managers. The big difference is one of style, though in this case the style has real substance. agile managers coach, inspire, and lead teams more than they measure and manage them. They focus on the organizational environment’s ability to deliver value more than they worry about their department’s own measurements. An agile manager’s effectiveness in these eight areas is further helped (or hindered) by her personal leadership style, the company culture, and her ability to enact the competencies in an agile-values-based way. Knowing oneself deeply, and having an understanding of these style and culture dynamics, is essential. For the agile manager, teams become a fundamental object of study: how they work and develop over time; how to form them and nurture their growth; and how to measure, reward, and sustain them for the long term. The agile manager’s domain is as intimate outsider and champion of the team, not as inside micromanager or chum. Agile teams do not need managers directing their work. Instead, the manager’s role is to set the team up for success and then support from the outside – from the boundary of the team itself. Teams need sponsors outside their boundaries who can champion and cheer them through their challenges. An agile manager’s goal is to enable the team to solve its own problems and come up with its own amazing insights and products. Skills such as assessing team health, removing organizational impediments, making room for failure, and having the ability to coach become central. Agile processes value getting work done over having items in progress. The question for an agile manager becomes, “How can I array people to best increase throughput?” rather than, “How can I maximize ‘my’ people being utilized at 100 percent?” Assessing the organization’s current resource management model will help the agile manager understand its (often negative) impact on agile teams. By understanding both the downsides of task switching between projects and also the team dynamics of forming and developing over time, the agile manager is in a position to formulate a new resource management model that helps strong teams form and stay together for continued value delivery. Motivating teams, rather than merely individuals, becomes key for the agile manager. Working to change performance measurements to complement, rather than contradict, agile values is an important new goal. Even so, performance management for agile teams is about more than handling the annual or semi-annual performance management cycle with dexterity. The agile manager synchronizes with the cadence of the inspect-and-adapt cycle, helping performance feedback to teams and individuals become rapid, relevant, actionable, and open. Managing Investments: What is the Best Investment Now? In the pursuit of delivering the most business value possible to gain competitive advantage, the agile mindset regarding managing investments is, “What is the best investment now?” rather than, “Are we on schedule and on budget?” Getting the most from agile means moving from the conformance-to-plan paradigm to conformance-to-value thinking. An agile manager harnesses the metrics coming from the team and product owner both to help the team improve its own throughput and also to inform executives about how the teams are conforming to value. This requires a new mindset for using metrics, a new set of updated executive-style status reports, and a new ability to address the changes in conversation that occur when executives become engaged in reacting to and enabling business value delivery rather than handing out carrots or sticks based on stoplight views of scope, schedule and budget. An agile manager leverages the portfolio management and governance process to reinforce agile values: the ability to maximize value while embracing feedback and change. Generally, a more frequent cycle becomes essential as management begins to manage the portfolio of projects just as a product owner manages a portfolio of stories. In both cases the goal is to make frequent planning cycle decisions regarding which projects to stop, start, or continue based on which will return the highest business value now. 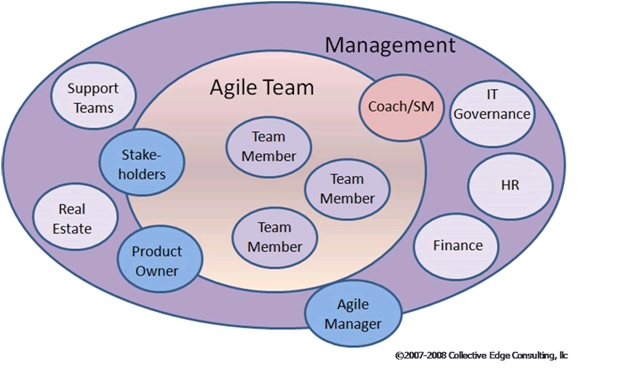 Agile teams operate within an overall organizational environment that includes support processes and suppliers. As agile teams begin operating with newfound speed and agility, the rest of the organization tends to slow them down. The agile manager is in the position of bringing a lean perspective that focuses on flow and the elimination of waste. Managing internal partners, such as finance, governance, real estate, production support and others, requires thinking (and acting) like a lean manager. An agile manager uses lean skills such as value stream analysis and kaizen to achieve a deeper understanding of what motivates internal partners. Through this, an agile manager leads (or provokes) activities to “lean-out” the end-to-end processes in which their teams participate so that the value their teams deliver can be realized without delay. For the sake of value delivery, agile managers treat their suppliers like they are an extension of their agile teams. To do this well, an agile manager uses new perspectives and techniques when crafting contracts with suppliers and knows strategies to help teams cope when suppliers will not work in an agile manner. An agile manager also knows that the decision to outsource a function of the team is purely a business call. Given the reality that outsourced functions generally create a velocity drag on agile teams, a manager will carefully weigh the benefits and costs before pursuing an outsourcing model and will empower teams to adjust the model to reduce velocity drag. For an agile manager, organizational change management is about being an organizational change artist. Affecting existing performance management systems, working with peer managers to lean-out business processes, and saying “no” to starting more work are all typical examples of thorny organizational impediments that an agile manager will likely face. When agile is introduced into an organization, a tremendous amount of organizational change must occur to empower and enable agile teams in their pursuit of delivering business value. An agile manager needs to develop keen skills in organizational change and an ability to shepherd an organization through the adoption change curve. The agile principle of inspect-and-adapt applies to agile managers as well. To that end, we’ve devised a few questions agile managers can ask themselves to see how they measure up to the full expression of the agile manager role. * Are you catalyzing organization change to support agile values, starting with marshalling a culture of value delivery? * Do you provide significant organizational roadblock removal for agile teams? Do they perceive you as a coach and leader more than as a manager? * Are you able to effectively distribute resources across teams to maximize team value delivery, rather than striving for resource utilization per se? * Is your performance management system helping guide teams to their highest performance, while fairly evaluating both individual and team contributions? * Do you use metrics to help teams improve their performance and to help senior leaders make decisions that improve value delivery? * Does your organization make frequent project portfolio decisions based on value rather than conformance to schedule and budget? * Are you helping your internal partners create lean processes to synchronize with agile teams, rather than tolerating their velocity drag? * How are suppliers encouraged to work in an agile way? Does your outsourcing help or hinder your agile teams?